Discussion in 'Apple iOS' started by hoss halo3 modder, Jun 13, 2009 with 6 replies and 408 views. ok i found this and i thought it was really gay. 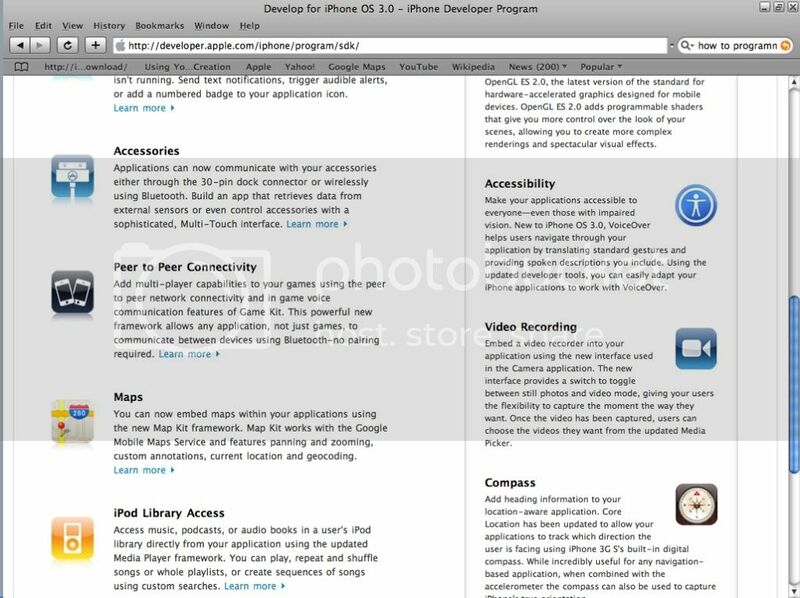 i was looking at stuff about the iphone 3.0 sdk and i came across this on the apple website. look at the right center where it has video recording. its says that dev. can use it in there apps for the 3.0. i was thinking why dont they just put it on the 3.0 software? Iphone 3.0 on my iphone already!! it is on the 3.0 software. There's two reasons why first-gen and 3G users won't see official video recording. The camera is a barebones CMOS sensor, not designed for anything but still photos. Apple also wants you to upgrade to the 3G S so they can get the $. Well as technology is going up in the mobile phone companies making changing in there all cell phones now i phone are coming in market through this we can enjoy from internet and other function at a time.